One day, I woke up with a realization that I need to paint and draw more. 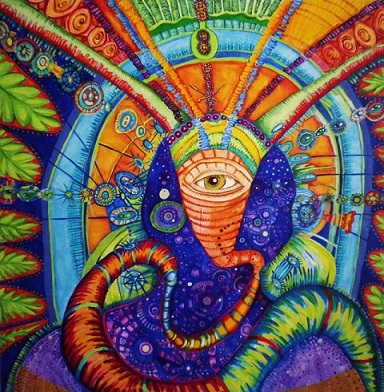 I need to express my divine energy in a creative way. 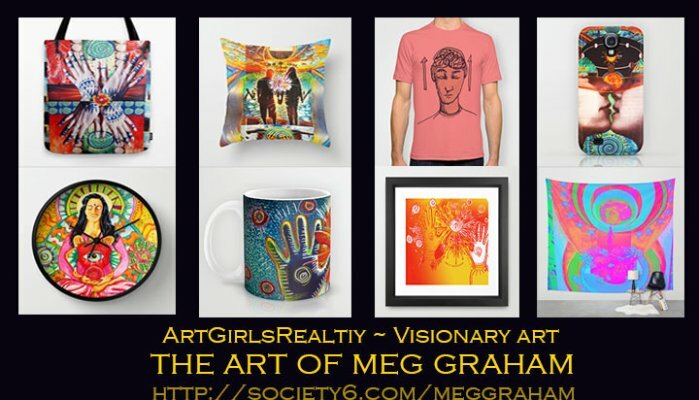 I remembered Meg Graham, who I have met in a Reiki class many years back and her inspiring art that she posted on Meg’s Art facebook page. So I reached out to Meg and we set on time and date for a personal class to learn to draw Mandalas. I didn’t know what to expect but I was excited and open for expressing myself. I thought there would be many rules to this complex work of art. Sitting on a small chair in Meg’s apartment studio in Staten Island, I was quickly proven wrong. Meg took few minutes to guide me through a meditation and breathing technique to connect to my energetic centers (chakras). Then she handed me white pencils and told me to just doodle on the black paper. “You don’t need to think at all, just go for it,” she insisted. After I was finished drawing with white pencils, Meg handed me colored pencils and instructed to choose a theme for my next mandala. I picked the “Love” theme since I recently started a new relationship and was basking in those beautiful feelings. Using the compass, I created circles and filled them with colors and patterns that naturally took their forms with their own symbols of conscious and unconscious mind. Meg was drawing along with me and you could see that our mandalas were very different. 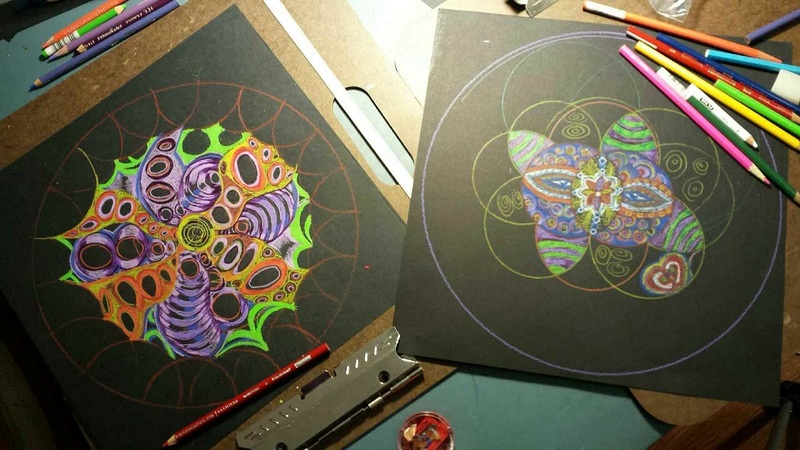 Meg shared how her mandala work started few years back after taking a course. “I find when I make a Mandala at lunch my hectic stressful morning starts to melt away and my heart center opens up. I totally become more of a happy camper,” Meg confessed. Mandala drawing became Meg’s daily practice to find inner peace and I could see how it could easily become mine. 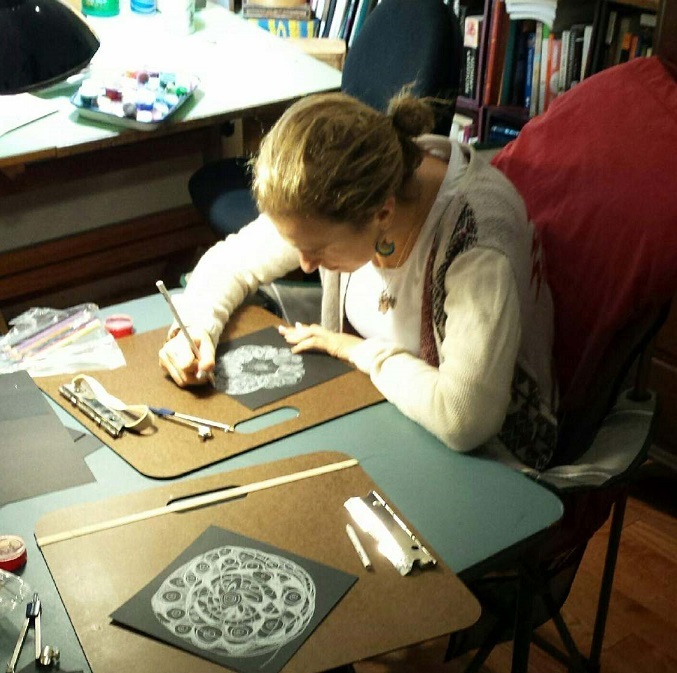 Over the years, Meg started teaching mandala drawing workshops and playing with different types of mandalas, some became collage drawings, many of which she showcases in art showings and others that are hanging in her apartment. 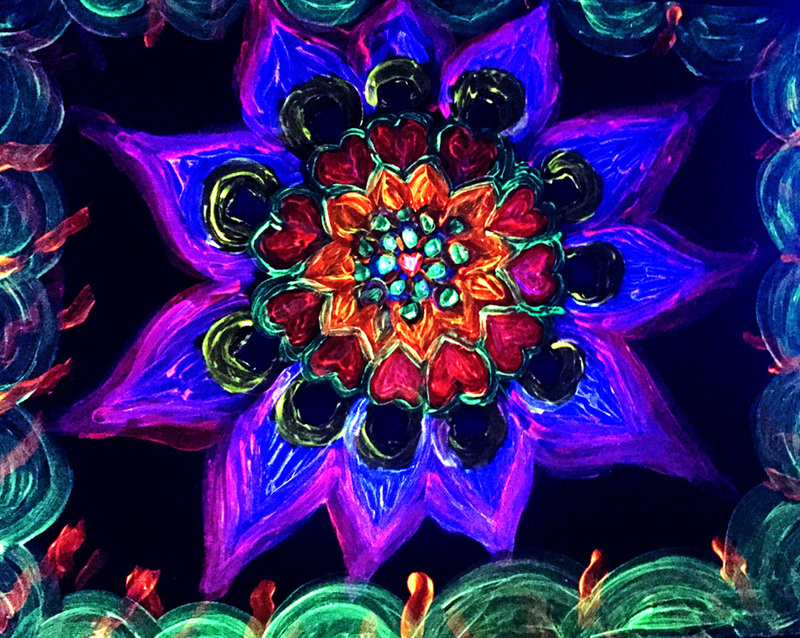 A few months after taking Meg’s workshop, on a snowy day, I painted my mandala with neon colors that glow with black light: I have also introduced my kids to the mandala painting and it became our family activity. I find that just like meditating, drawing mandalas should be a daily practice in each person’s life. There are even iPhone application tools like Silk that allow you to doodle on the go.